5 low-stress ideas for when you feel too busy to sew! Sometimes life gets busy and we all get into a dry spell, right?? I sometimes go a month without touching the sewing machine or flipping through my pattern collection. As I've shared in some of my other sewing inspiration posts, there are ways to get out of a rut or feel energized again about a hobby like sewing! And sometimes, it's even better to take it easy and let the dry spell run its course. 5 Low-Stress Ideas for When You Feel "Too Busy to Sew"
These tips have helped me when I don't have time for hours and hours of uninterrupted design-cut-sew-press-photograph-ing! These principles can translate to other creative tasks that take time, supplies, energy, and confidence. 1. Look at your favorite inspiration sources. I like to look at the magazines piling up on my coffee table, or J.Crew Factory's new dresses, or Kendi Everyday. Work up some inspiration pins to look back at next time you're ready to cut something out. 2. Clean your sewing area. 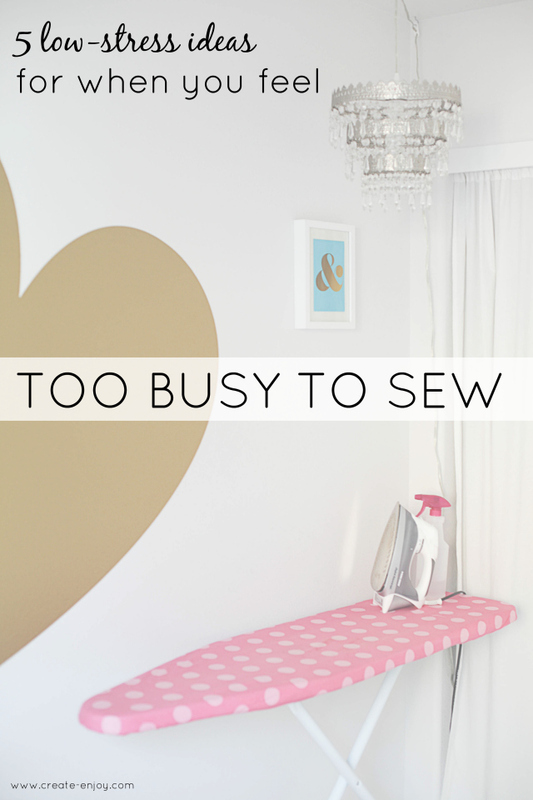 When things pile up, it's no fun to sew at your sewing desk. I tend to collect papers and mending projects on mine! So even if I don't have time to sit down and sew at the same time, just chipping away at the access barriers helps. The other day I vacuumed the office/sewing room and felt so much better about it! 3. Take a bigger-picture look at the calendar. Are there holidays or big events coming up, occasions for a new dress or outfit? Maybe you don't have time to sew this week, but you can plan ahead and carve out some time here and there if you're motivated for an upcoming reason to wear something new! 4. Go fabric shopping. In person or online! If you're out running errands and have a few extra minutes, stop by the fabric store and look around. If you're really way too busy, maybe only buy one thing. One new piece of fabric you love, inspired by a pin or magazine page or whatever. Having a manageable exciting new supply may motivate you to do one step at a time and plan a pattern cutting-out session! 5. Do something else creative. Like, for example, something less time-consuming than making a new dress from scratch. Sewing is a time-consuming hobby, compared to some, like cooking or even some jewelry-making. I love it because it lets me be creative and make something useful and beautiful, but... so does trying a new recipe or cleaning off my dresser, or sometimes even working out! Go easy on yourself, you'll still have the skills and creativity when you get back to it. Hope those help! What gives you motivation or forgiveness in the busy times? Great tips! I also believe in making a deal with oneself to spend only say 15 min on a sewing project. I find I can get so much out of a short time period when I know that's all I have (because I don't spend 10 min choosing what music to listen to!). I agree, these are great tips. I get into a rut of thinking if I don't have a whole weekend to sew, then there's no point getting all my stuff out, but I think it would improve my productivity (and my attitude towards my productivity) if I could learnt to do little bits here and there - as you say, taking advantage of those 15 minute chunks of time. Totally! 15 minutes is 100% more than nothing!